Seven-time Formula 1 world champion Michael Schumacher is in hospital after suffering a head injury in a skiing accident. The 44-year-old fell while skiing on unmarked slopes in the French Alps and hit his head on a rock. He was attended to within minutes of the accident before being airlifted to Moutiers hospital. According to the Press Association, Gernignon Christophe Lecomte - director of the Meribel resort in which Schumacher was staying - told Radio Monte Carlo Sport that the ex-Ferrari and Mercedes racer was conscious, and was airlifted with 15 minutes of the accident. The German's manager Sabine Kehm confirmed nobody else was involved in the fall, and was also quoted as saying: "Michael fell on his head when he was on a private skiing trip in the French Alps. He was taken to hospital and is receiving professional medical attention. "We ask for understanding that we cannot give out continuous information about his health." Schumacher retired from F1 for a second time at the end of 2012 after scoring just one podium during a three-year stint with the revived factory Mercedes team. He made his grand prix debut for Jordan in 1991 before immediately switching to Benetton, with whom he won back-to-back titles in 1994 and 1995. Schumacher switched to Ferrari for the 1996 season and dominated the sport in the early noughties with the Scuderia, winning an unprecedented five titles in a row from 2000-'04 before retiring for the first time in 2006. 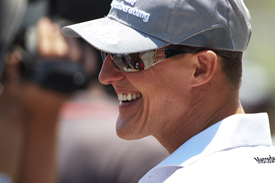 In addition to his record seven titles, Schumacher remains the sport's all-time leading race winner with 91 victories and also leads the way in pole positions, fastest laps and podium finishes.